Our busy fall schedule has officially begun and my slow cooker has taken center stage on my kitchen counter. I realize that boiling ravioli in a pot, heating sauce in another and throwing it all together at dinner time is not that difficult for most people. I wish that was the case in our household. Some days, I walk in the door at 5:30 with three cranky children who still need a backpack emptied, help with homework, a diaper changed, some love and attention and baths. These events often lead to the drama of "witching hour" that may include but are not limited to: one part insanity, one part hilarity and one part irrationality. Having dinner hot and ready to be served as we do our best to keep the insanity to a minimum, enjoy the hilarity and teach rational behavior is absolutely a necessity!!! 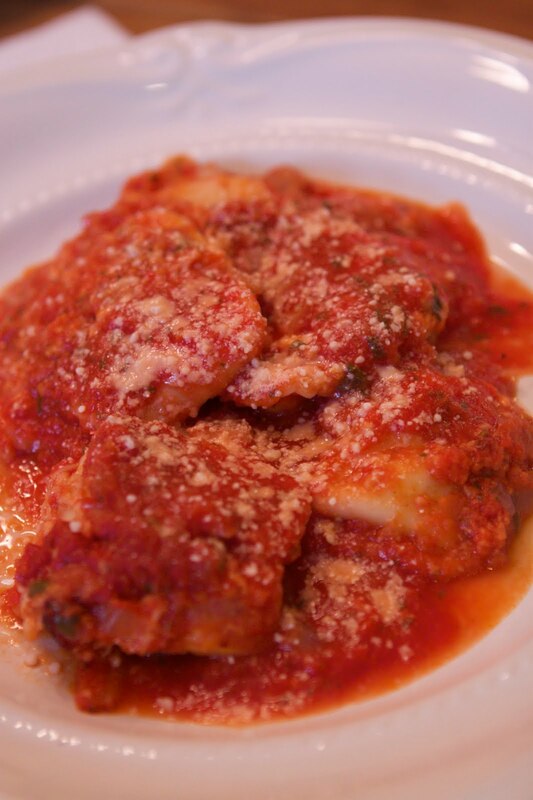 Enjoy your ravioli casserole with some crusty french bread and a big glass of wine! Prep Ahead Plan: This meal only takes a few minutes to assemble in your slow cooker. I usually throw it together in the morning. It can't be done the night before or your ravioli will defrost. 1. Mix wine with tomato sauce. Pour about 2 cups of tomato/wine sauce in slow cooker, add in garlic and one package of frozen ravioli, 1 cup mozzarella and 2 T parmesan cheese. 2. Add 2 more cups of tomato/wine sauce, the last package of ravioli, the remaining mozzarella and 2 T of parmesan cheese. Cover with remaining tomato/wine sauce. 3. Cook on low for 6 hours. Serve with remaining parmesan cheese sprinkled on top! This looks delicious! If I made 1/2 the recipe do you think I would need to make any changes? Hmm...I don't think you would need to make any changes, Janet! Let me know how it comes out! Copyright © PrepAhead and Dine In: Ravioli Casserole (slow cooker). All Rights Reserved.